I Don’t Protest I Just Dance in my Shadow is a brazen tribute to those who’ve ever fought to make their mark on an unyielding world. 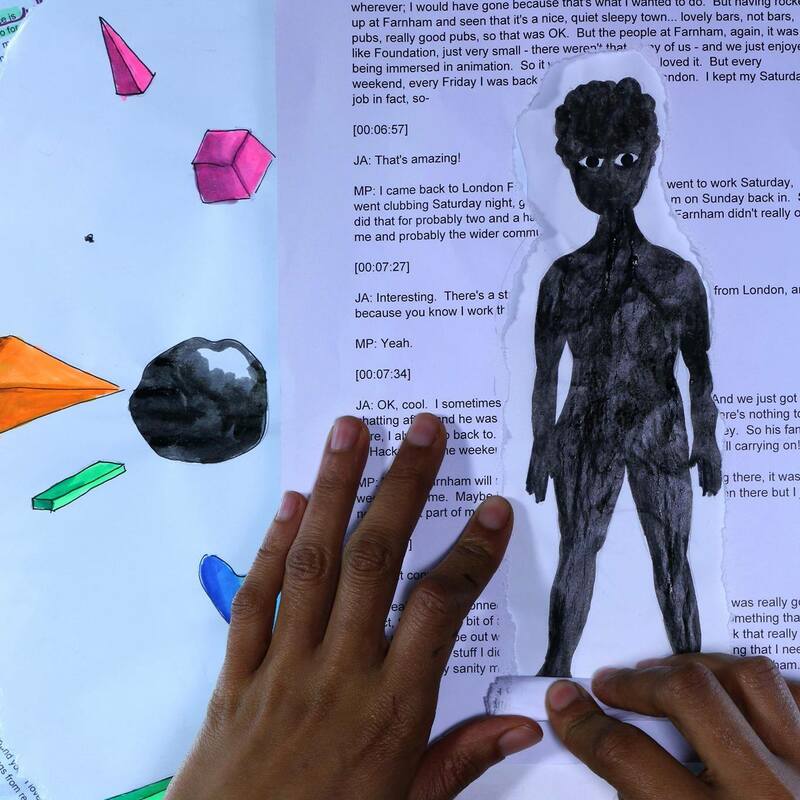 BAFTA New Talent nominee and Scottish BAFTA winner Jessica Ashman zeroes in on the experience of the black female artist as she navigates the world of animation and visual art. After interviewing a mix of black female artists, she’s meticulously built an art installation to do their emotions justice. The result is a breathable space wherein frustration, insecurity, relief and affirmation can bounce freely off the whitewashed walls. The multifaceted nature of these women’s experiences manifests itself in varying forms. As one artist states, these are “diasporic stories too complicated to fit within a single medium”. Suitably, Ashman uses art forms both audio and visual to showcase them. She invites us to observe them in her experimental short film I Don’t Protest I Just Dance in my Shadow. Here, highlighted excerpts of the interview transcripts, the artists’ faces and Ashman’s own stylized 2D animation and stop frame technique is exhibited. Likewise, fragmented excerpts of the transcripts hang delicately from the ceiling. These are bold and explicit references to the racialisation and gender based discrimination each artist has experienced. Meanwhile, their words vibrate across the room, each screen playing the loop at a different point. It’s disorientating; unmelodious voices crowd the brain as it struggles to focus on script. The effect is intentional. Ashman wanted the audience to perceive the confusion she felt whilst processing the thoughts of these women. In fact, the beauty lies in the dissonance. “It’s okay as a creative black woman to feel and stumble your way through the creative process”, Ashman assures us, “it’s okay to not subscribe to a certain style or stereotype”. Is this how black art looks when liberated from limitation? “Often black women artists can only talk about their race along certain lines and viewpoints. They have to be incredibly outspoken about race or ignore it completely”, Ashman states. Yet I Don’t Protest I Just Dance in my Shadow deftly touches upon the complexities of identity, race and gender, nuances and all. It is neither garish nor tame. Ashman has deftly weaved together the experiences of these unique women with a finesse achievable only with authenticity. Finally, a black woman at the helm of her own narrative. Our invitation to momentarily don a black female lens is precisely that. The installation is wholly immersive and unapologetically so. Its powered by the incandescence of the artists’ stories, their determination to pave their own way. But what of current efforts to make the animation/ visual art world more inclusive? 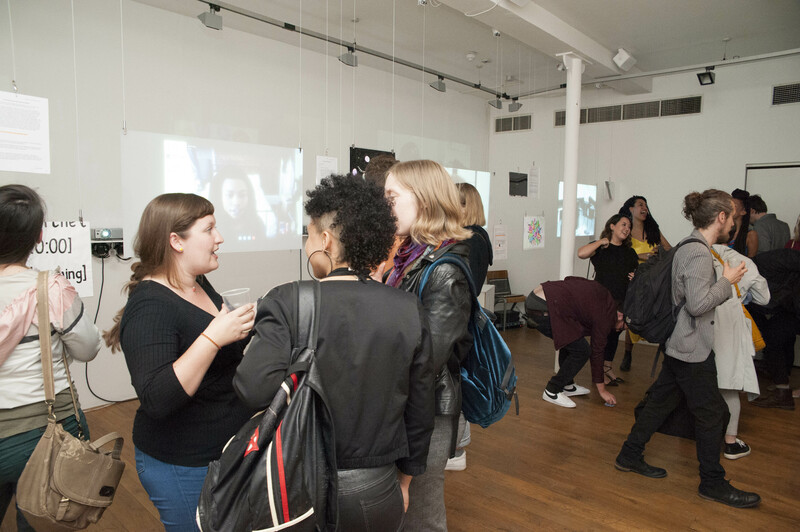 “Apart from the occasional scheme or initiative to get more black female artists or women of colour into white art spaces, the leaps and bounds I see are with the women who just do it themselves, those who form their own collective and don’t ask for permission to say what they want” Ashman declares, “Then funnily enough, these big institutions come running to join in”. I Don’t Protest I Just Dance in my Shadow is running at the Four Corners gallery until Saturday the 10th of June.